What will you remember? At graduation or many years from now, what good memories will come to mind when you look back on your life as a Villanova student? I remember the Open Mic Poetry Readings—seeing a finance major, followed by a mathematics professor, then a star athlete approach the open mic. I did not expect to have something meaningful in common with these diverse strangers. But I experienced a connection with each of them as they shared either poems they wrote or someone else’s poems they enjoy. I appreciated their willingness to share their creativity, their passion, their honesty. And I remain grateful for those fond memories. Do something worth remembering. Come to the Open Mic event. Listen to your colleagues. Or better yet, contribute to everyone else’s good memories; share a poem of your own or a favorite poem by someone else. 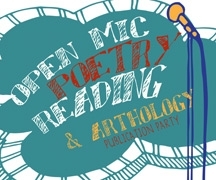 The Department of English and Falvey Memorial Library’s annual Open Mic Poetry Reading will take place on Wednesday, April 23, from 12:00 p.m. to 1:00 p.m. in the Library’s Speakers’ Corner.